The Atlas Troll title, and accessory must be used together to get either of the effects. The Torgue Violator title doesn't provide any of the effects, just the red flavor text. The barrel provides all the bonuses. acc.acc1_Fanged - - - - - gives a +100% melee damage bonus. 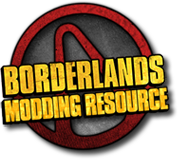 acc.acc1_Lacerator - - - - - gives a +200% melee damage bonus. acc.acc2_Atlas_Troll - - - - 100% "Troll"/ Very slow health regeneration. acc.acc2_Stabilizer - - - - 100% "Stabilizer"/ Stabilizer greatly reduces recoil. acc.acc3_LaserSight - 100% - - - "Laser sight"/ LaserSight reduces accuracy loss while firing so your shots do not spread out as much. acc.acc4_DoubleShot -18% -75% - - - Add 20% clip size. Add 1 projectiles per shot, causes the gun to fire 2 rounds at once. acc.acc4_SandS_Gemini - - - - - Add 60% clip size. Add 1 projectiles per shot. 200% burst fire count. "Gemini"/ Fires 2 round bursts and fires 2 bullets for each shot, so each burst fires 4 bullets. acc.acc5_Corrosive -40% - - 6 - "Corrosive"
acc.acc5_Hornet_Dahl_Corrosive 15% - 150% 10 -100% 200% burst fire count. "Hornet"/ High corrosive damage and fires in 2 round bursts. acc.acc5_Maliwan_Firehawk 10% 70% - 14 - "Firehawk"/ Extremely high fire damage and proc chance. acc.acc5_Shock -40% - - 6 - "Shock"
Action.action1 - - - - - gives no stat bonuses. Action.action2 - - 8% - -5% gives a slight boost to the fire rate and increases recoil. Action.action3 - - 12% 2 20% increases the fire rate, reduces recoil and adds tech. Action.action4 11% - -9% - -45% reduces the fire rate, greatly increases recoil and greatly increases damage. Action.action5 6% - 36% - - [preferred] greatly increases the fire rate and increases damage. Barrel.barrel1 -4% - - - - has low damage and low accuracy. Barrel.barrel4_Torgue_Violator -100% - 200% 2 -200% Add 2 projectiles per shot. 300% burst fire count. "Burst Violator"/ Fires 3 round bursts and fires 3 bullets for each shot, so each burst fires 9 bullets. Body.body1 -8% - - - - "BLR"/ slightly decreases damage. Body.body2 10% - -20% - -30% "RF"/slightly increases damage, slightly reduces fire rate, and adds recoil. Body.body3 -15% - 30% 2 30% "TK"/ [Preferred Rof] slightly decreases damage, increases fire rate, reduces recoil, and adds tech. Body.body3_Tediore_Protector 25% - 30% 3 30% Ammo regen rate 30%. "PRO"/ increases damage, increases fire rate, reduces recoil, adds alot of tech, and adds ammo regen. Body.body4 20% - -30% - -50% "HRD"/[Preferred Dmg] increases damage, reduces fire rate, and adds alot of recoil. Grip.grip2_Atlas - - - - - "Atlas"
Grip.grip3_Maliwan - - - - - "Maliwan"
Grip.grip4_Dahl - - - - - "Dahl"
mag.mag1 - - - - - 30% reload speed, slightly faster reload speed. mag.mag2 - - - - - Add 4 rounds, increases the clip size. mag.mag2a - - - - - Add 6 rounds. 50% reload speed, gives the largest clip and fastest reload speed. mag.mag3 - - - - - Add 12 rounds. mag.mag3_Vladof_Rebel 12% - 20% - - Add 22 rounds. 15% reload speed. Large magazine, increased fire rate, and higher damage. ManufacturerMaterials.Material_Vladof_3_Rebel - -32% 56% - 40% Add 30% clip size. "/VXX"
Prefix.Prefix_Acc1_Fanged - - - - - "Fanged"
Prefix.Prefix_Acc2_Stabilized - - - - - "Stabilized"
Prefix.Prefix_Acc3_Sighted - - - - - "Sighted"
Prefix.Prefix_Nasty 12% - - 3 - Add 2 rounds. 10% reload speed. "Nasty"
Prefix.Prefix_Noble 12% - - 3 - Add 2 rounds. 10% reload speed. "Noble"
Prefix.Prefix_Quality1_Bad 6% - - 1 - "Bad"
Prefix.Prefix_Quality2_Cruel 9% - - 1 - "Cruel"
Prefix.Prefix_Quality3_Wicked 12% - - 1 - "Wicked"
Sight.sight5_Hyperion_Invader - 100% 250% 1 - 10,000% burst fire count. "Scope"/ Fires the entire magazine at once when zoomed with a greatly increased fire rate. Title.TitleM_Atlas1_Troll - - - - - "Troll" "Pain Heals." Title.TitleM_Dahl1_Hornet - - - - - "Hornet" "Feel the Sting"
Title.TitleM_Hyperion1_Invader - - - - - "Invader" "12 bullets invade your skull"
Title.TitleM_Maliwan1_Firehawk - - - - - "Firehawk" "Bring the HEAT!" Title.TitleM_SandSl1_Gemini - - - - - "Gemini" "Double Whammy." Title.TitleM_Tediore1_Protector - - - - - "Protector" "Ammo is no longer an issue." Title.TitleM_Torgue1_Violator - - - - - "Violator" "Your move, Creep." Title.TitleM_Vladof1_Rebel - - - - - "Rebel" "Never stop shooting!" Title.TitleU_Krom_KromsSidearm - - - - - "Krom's Sidearm" "a gift from Papa Krom"
Title.TitleU_LadyFinger - - - - - "Lady Finger" "Omnia vincit amor"
Title.TitleU_Retail_TheDove - - - - - "The Dove" "Sometimes, I forget to reload." Title.TitleU_Repeater_AthenasWisdom - - - - - "Athena's Wisdom" "War is the final option"
Title.TitleU_Repeater_ChiquitoAmigo - - - - - "Chiquito Amigo" "Say "Hello""
Title.TitleU_Repeater_KnoxsGold - - - - - "Knoxx's Gold" "Bling!" Title.Title_Acc2_Lacerator - - - - - "Lacerator"
Title.Title_Accuracy1_Swatter - - - - - "Swatter"
Title.Title_DamageLow1_Peashooter -5% - - - 200% Add 40% clip size. "Peashooter"
Title.Title_Firerate1_Needler - - - - 20% Add 2 rounds. "Needler"
Title.Title_Quality1_Raptor - - - - - "Raptor"
Title.Title__Repeater - - - - - "Repeater"
UniqueParts.KromsSidearm_barrel5 - 130% 200% 5 - Grants three-shot bursts when zoomed, and much higher tech level – useful for the mandatory shock accessory. However, it lacks the 15% damage and lower recoil bonuses granted to normal [barrel5] repeaters/ 300% burst fire count. 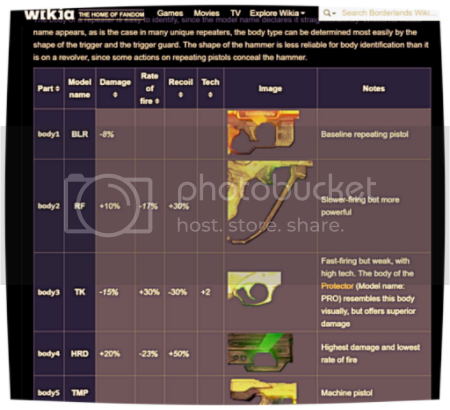 UniqueParts.KromsSidearm_Material 19% - 5% 1 -11% Mostly equivalent to [Material_Atlas_2], with marginally increased damage/ +15% clip size. UniqueParts.LadyFinger_barrel1 15% 20% - - - +100% critical damage. UniqueParts.TheDove_barrel4 - 30% - 1 -10% This part has similar handling characteristics to those of [barrel4], but lacks the damage boost. Instead, it gives one bullet free per trigger pull. 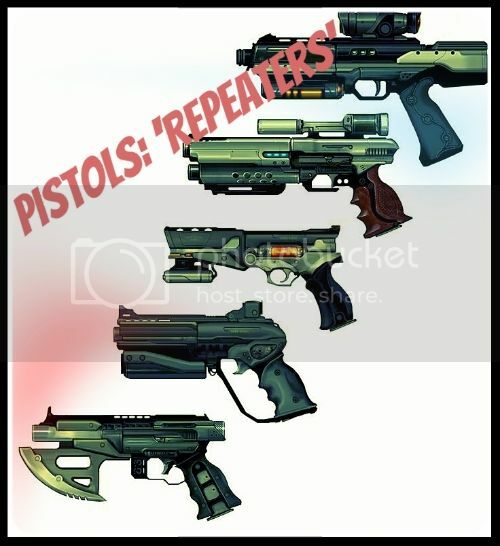 UniqueParts.RepeaterPistol.barrel5_AthenasWisdom 20% 200% - - 50% Improves accuracy and handling of the gun when firing/ +120% critical damage. UniqueParts.RepeaterPistol.barrel0_ChiquitoAmigo -25% - 100% 4 200% greatly improves rate of fire, magazine size, and recoil handling. However, it suffers a slight damage penalty compared to the normal barrel0/ +250% clip size. UniqueParts.RepeaterPistol.Material_ChiquitoAmigo_3 -5% -15% - - - Equivalent to Tediore Material_Tediore_3/ 100% reload speed. "-B"
UniqueParts.RepeaterPistol.KnoxsGold_Material 20% - - 4 - Heavily modified Material_SandS_3/ As a unique weapon, Knoxx's Gold imposes no restriction on the parts it spawns with. Also has a high resale value/ +55% clip size/ 35% reload speed/ ".99"